Armin van Buuren received the first copy of his ‘Embrace’ album yesterday. The CD is the very first physical issue of Armin’s sixth full-length artist album, to be released on 29 October by record label Armada Music. 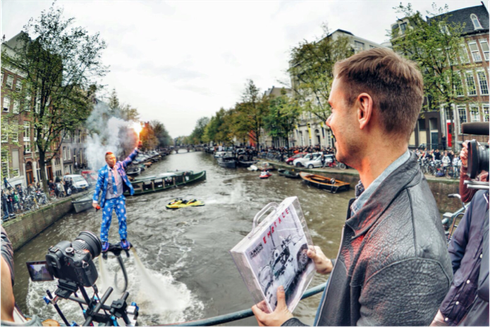 Armin was handed a briefcase containing the physical album copy by fly board pilot Bo Krook during his performance in the Amsterdam canals. Afterwards, the electronic music artist set foot on the Armada Music boat docked in front of the Felix Meritis building. The album includes fresh collaborations with Dutch Jazz trumpeter Eric Vloeimans (‘Embrace’), singer-songwriter Cimo Fränkel (‘Strong Ones), award-winning Dutch band Kensington (‘Heading Up High’), and fellow Grammy nominee Gavin DeGraw (‘Looking For Your Name’), alongside previously released singles ‘Another You’ (with Mr. Probz) and ‘Off The Hook’ (with Hardwell). The artwork for the album was shot by well known Dutch photographer Anton Corbijn.